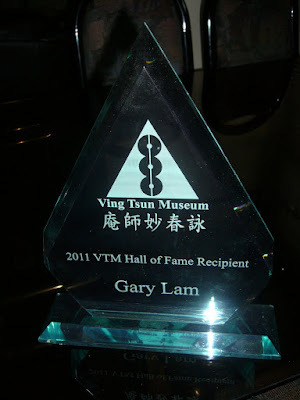 Congratulations to Sifu Lam for being inducted into Wing Chun Hall of Fame by the Ving Tsun Museum . The VTM's is based in Ohio , USA . Each year, the Museum selects one important figure who has made an impact on Wing Chun for inclusion. Grandmaster Yip Man, Sigung Wong Shun Leung and Sigung Moy Yat …were among the previous inductees. This rare honor was preceded by “Best Sifu of the Year” award by the World Ving Tsun Athletic Association in 2006.